NawTone+Plus Acrylic Masonry Stain (formerly NWRT-91) is a hydrous, multiple polymer formulation of resin solids, color pigments and a specially formulated tint base, with the added benefit of a quality water repellent—that’s the plus. This combination achieves a wide range of colors designed to exhibit the overall characteristics of being: light fast, UV resistant, penetrating, aspiratory, and quick drying, while being mold, mildew, fungus and weather resistant. The water repellent offers added surface protection against waterborne contaminants. We customize the application and the degree of translucency to meet the aesthetic requirements while always maintaining a natural look. This product can be applied in color densities from a wash of faint color through to full opacity. NawTone+Plus is used for matching additions, historic preservation, complete color changes, decorative applications and solving color problems in masonry and concrete. NawTone+Plus is ideal for matching masonry colors. 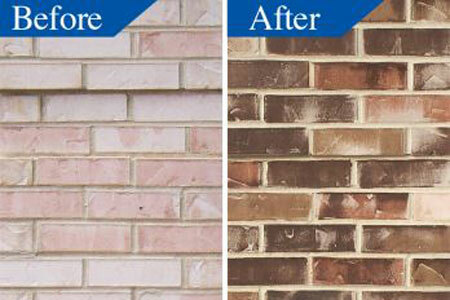 It can be used on brick, block, mortar, stucco, EIFS, and concrete surfaces. NawTone+Plus is water based, nonflammable, non-hazardous and has very low VOC content. Verify that any masonry, concrete, stucco walls that have been treated with any form of chemical/acid wash are neutralized. Verify that masonry, concrete, stucco, in existing building are structurally sound and fully intact. Alkali or efflorescence should be treated with proper neutralizing compounds as recommended by masonry supplier before application can begin. Walls must have a neutral pH for product warranty to be in effect. NawTone+Plus can be applied in temperatures of 25°-110°F (3.8°-43.3°C). Masonry surfaces should be dry before work begins. Applied by spray, roller and hand applications depending on the desired finish. NawTone+Plus (NWRT-91), when applied by Nawkaw and Nawkaw Accredited Applicators, carries a limited 25-year warranty. This warranty is a full service warranty and is not limited to supply of replacement product. Nawkaw Corporation carries a wide variety of masonry related products.